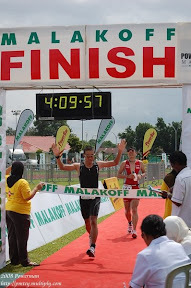 Since reading the website http://www.everymantri.com/everyman_triathlon/2009/11/zen-and-the-art-of-triathlon-brett-completes-selfsupported-ironman-in-1315.html, introduced by Ahmad Fathi in his facebook, I’ve been thinking of doing it myself. But doing the full Ironman of 3.8km swim – 180km bike and 42 km run would be too much for me, instead it would be enough for now just to try half Ironman – 1.9km swim, 90km bike and 21km run. This year I’ve missed a lot of opportunities to race the half Ironman distance in Singapore (Singapore 70.3) and Malaysia (Putrajaya 70.3) due to work commitment, Swine flu and due to time constraint. If it wasn’t for swine flu, Zaeidi and me would have taste the pain of Putrajaya 70.3. They rescheduled it 10 days after Hari Raya Aidilfitri which to us is not favorable. Doing a self organize half ironman would need proper planning especially the routes to be taken during the cycling and running. I would predict the time taken to complete the whole cycle of swimming, cycling and running would be around 6 to 9 hours. – 1hour for swimming, 3 hours for cycling and 2 hours for running for a well fit person e.g. Ahmad Fathi. Swimming in the open sea/river/lake without any person looking over you is very dangerous and in Brunei it is not advisable since we don’t have a proper locations for open sea swim. For safety reasons, swimming pool is the best choice. Public swimming pool in Brunei is mostly government own and the pool is usually open around 8:30am, so for a 6 to 9 hours event, I would probably finish my run around 2:30pm to 5:30pm. So the next best option would be JPMC, Jerudong. They have 50m pool (I think so) and they open around 7:00am. The entrance fee for non-members would be somewhere between $5 to $10 – need to check again. If we start around 7:00am we would finish around 1:00pm to 4:00pm. JPMC is located in Jerudong. Next to it is the Muara-Tutong Highway – a favourite place for cyclists and the Jerudong Park Playground – good area for the running route. The Run Route – 3 Loops of JPMC to Jerudong Playground with the last lap just go straight to JPMC instead of going to Jerudong Polo Club. The run route passes a few strategic areas such as restaurants, toilets, shops and some areas are shaded with foot path. If I’m feeling ready, I’ll try it sometime before Christmas or early January. Its good if the rest of the guys will be doing it also so that the spirit of competiveness is there. Actually the idea is from Ahmad Fathi and most of us are willing to try. He said he will try to organize it around December. It all in the planning. Maybe I’ll go and do it or maybe not. well done in planning the route. bah no need to dream anymore.. lets just do it!!!! we do in december after i get back from spore marathon. maybe masa cuti awal tahun hijrah..
Did you do the route with a Garmin? What program lets you trace routes like that? i used google earth and use one of the measuring tools built in. Garmin can be integrated with google earth. you upload ur workout to your pc using the garmin software and then upload the readings to google earth via the garmin software. have u confirm the dates yet?